I have noticed that I seem to be getting more choked up at funerals than I once did. This could pose a problem, since I am often the preacher at funerals I attend! At first I thought that perhaps I was becoming more emotional. That does occasionally happen when one gets older. Then I had another thought. What if the reason for my watery eyes and runny nose was not the welling up of emotions, but the presence of so many fragrant flowers nearby? The preacher often sits very close to a virtual wall of flowers, and I have come to believe that this is the reason for my getting choked up. Maybe I should keep this information a secret. 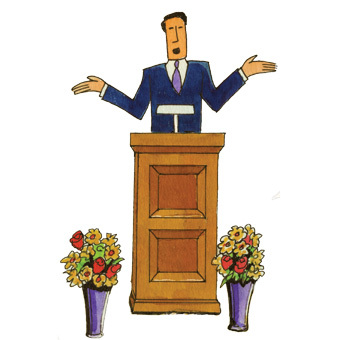 It might be good to be known as the preacher who cares enough to get all choked up at funerals! In any case, we all should “…mourn with those who mourn.” (Romans 12:15). But if you really want to look like a caring person, sit close to the flowers! “There is a time for everything, and a season for every activity under the heavens…a time to weep and a time to laugh, a time to mourn and a time to dance.”—Ecclesiastes 3:1,4). This entry was posted in Christian Living, Humor, Leadership and tagged a time to weep, crying at funerals, getting emotional, grieving, illustration, mourn with those who mourn, there is a time for everything, time to mourn. Bookmark the permalink. I’m starting to daydream of dancing. I like the one where I dance around the chapel with my King Jesus. I’ll make sure no one is there when I do. So don’t tell anyone.